You are here: Home › Renewable, sustainable, and 40% less expensive than heating oil! Wood pellet central heating! It’s clean-burning; it uses locally sourced, renewable, environmentally friendly fuel; it works using the same proven, familiar combustion principles as your home’s oil or gas heating system. With a wood pellet heating system you can have it all—fuel-cost savings, thermostatically controlled central heat, and the knowledge that you’re burning a fuel that’s easy on the Earth while you are supporting local jobs, instead of sending your heating dollars over seas. Just like your oil central heating system, wood pellet heating systems work with the thermostat and all the other components already installed in your home whether you have hydronic (water baseboard) or forced hot air. An automated ignition system will only burn pellets when there is a demand for heat. 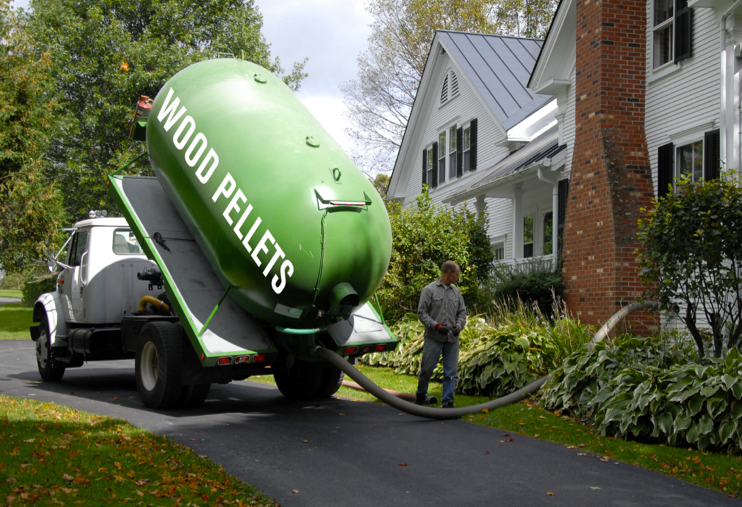 And just like your oil or gas delivery your wood pellet fuel is delivered about once a month and is entirely hands off. Wood-pellet heating has been successfully saving costs and the environment in Europe for over three decades and has begun to make inroads in North America over the past ten years. In fact, every year America ships over 2 million metric tons of US-produced wood pellet fuel over there so they can heat affordably and responsibly. Pellergy’s American-made wood pellet heating systems have been heating homes in the coldest parts of the US for the past 10 winters! They are tested, proven, UL approved, and just plain rock-solid. They are also approved by homeowner’s insurance companies, pre-approved by mortgage lenders, and—a real bonus—wood-pellet heating systems qualify for the many new federal and state green energy incentives and rebates. All of this makes switching to the new, high-tech, green-heat wood pellet central heating amazingly easy.